Imagine that you are one half of a cosmically powerful being. Wren Kergatha, a savant of forces, is heir to the incredible powers of the first ones. The big problem is, separated from her beta half, her abilities provide little more than token defense against demons and avatars. To make matters worse, the stronger half is bent on devouring her. 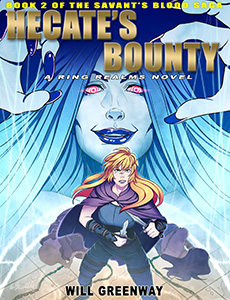 Hecate's Bounty continues Wren's epic quest to regain her memories, family, and heritage. Even with the potent help of the Felspar clan, the young savant of forces finds herself and her allies on the run from the minions of a pantheon lord. In order to rescue her parents and brother, Wren must find the lost city of Cosmodarus and confront the evil goddess of the moon. How will she defeat a creature able to ravage worlds?? ?